The County of Los Angeles Fire Museum is pleased to announce that the Prescott (Ariz.) City Council voted unanimously (7-0) to accept the museum’s bid to acquire the two crew transport trucks (buggies) used by the Granite Mountain Hot Shot Crew. Nineteen of the 20 Granite Mountain Hot Shot crewmembers perished at the Yarnell Hill Fire on June 30, 2013. 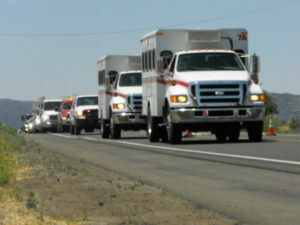 The buggies, which carried the Granite Mountain Hotshots throughout the Southwestern U.S. during the 2013 wildfire season, were deemed “surplus properties” by the City of Prescott since it had disbanded the unit. The museum’s bid of $25,000 for both vehicles was the only bid submitted, according to Prescott City Manager Michael Lamar. Under terms of the deal, both of the buggies will be owned by the County of Los Angeles Fire Museum. One of the buggies will go to the County of Los Angeles Fire Museum in Bellflower, and the other one is slated to be paced on loan to the Hall of Flame fire museum in Phoenix, Ariz. When a suitable facility is built in Prescott, the buggie at the Hall of Flame will them be moved to Prescott. Since 1988, the County of Los Angeles Fire Museum has been a 501 (C) 3 organization that currently boasts a dues-paying membership of nearly 3,000. We are a fiscally stable organization with the means to care for our collection, which consists of over 60 vintage fire apparatus, as well as a wide assortment of firefighting tools, equipment, uniforms, documents and images. We own a 10,000-square-feet building, rent a 14,000-square-feet warehouses, and will be moving into a brand new, purpose-built Fire Museum and Event Center in late-2017. We have partnered the City of Bellflower on this new facility, and construction is currently underway. “The County of Los Angeles Fire Museum will make sure these rigs are treated with the respect they deserve for decades to come,” said museum Vice President Joe Woyjeck.